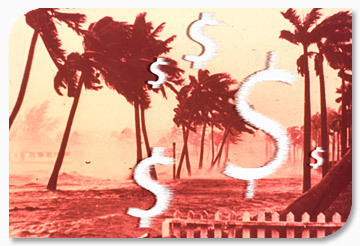 Determining in advance the socioeconomic and environmental damage and losses that will occur in in disaster situations is complex because of the uncertainties involved, for it is practically impossible to predict the moment, magnitude, intensity, and duration of an event, the components of the society that will be affected, and the impact on the community. Thus, potential impact always takes the form of a probabilistic estimate. Nevertheless, it is very important to consider the potential impact in order to develop plausible scenarios that can serve as a basis for prioritizing risk reduction interventions, strengthening preparedness, and putting the mechanisms for early recovery in place ahead of time. The previous section stressed the importance of having detailed studies of existing hazards conducted by competent institutions, as well as accurately identifying the vulnerability of the exposed system or population, in order to create a clear notion of the disaster risk that the health sector faces. Once a target level of protection has been defined, potential disaster impact must be assessed so that the health sector can decide what risk reduction, preparedness, response, and rehabilitation actions it must take. Post-disaster assessments coordinated by the Economic Commission for Latin America and the Caribbean (ECLAC) show that all disasters impact the health sector in a variety of ways: because the sector must deliver services and protect the populations health; because it is forced to modify health care programs or models in the medium and long term, or because health infrastructure and/or the health services network itself have sustained damage. Impact relates to both immediate needs and long-term conditions. In order to determine the financial cost of disasters, ECLAC, with technical support from PAHO, developed a damage and loss assessment methodology designed to determine the socioeconomic and environmental impact of disasters. The methodology has been used in various adverse events. 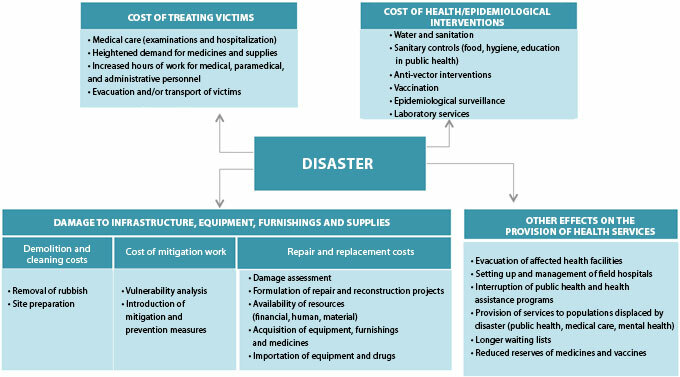 The diagram below summarizes the socioeconomic impact of a natural disaster on the health sector, where costs accumulate until rebuilding and restoring operating capacity is complete. The PAHO publication on Protecting New Health Facilities from Natural Disasters elaborates further on this subject. There are several elements not included in the ECLAC methodology: the cost associated with the deteriorating health status of the population due to the interruption of services; the overall impact on rehabilitation (since recovery requires large economic disbursements that are problematic when the rest of the country is also trying to recover); the need to rapidly reestablish health services (not only for population directly affected, but also for routine health care and public health programs); and the fact that there may be little incentive for outside investment in reconstruction because there is no methodology to place an economic value on these losses. In summary, disasters cause concrete damage and losses in the health sector that directly affect a country’s development and population. However, there are also social and political costs associated with the interruption of health services. Although these indirect costs are not quantifiable, they are very important. They can be ameliorated by investing in prevention and mitigation and by incorporating measures to reduce vulnerability during rehabilitation and reconstruction.